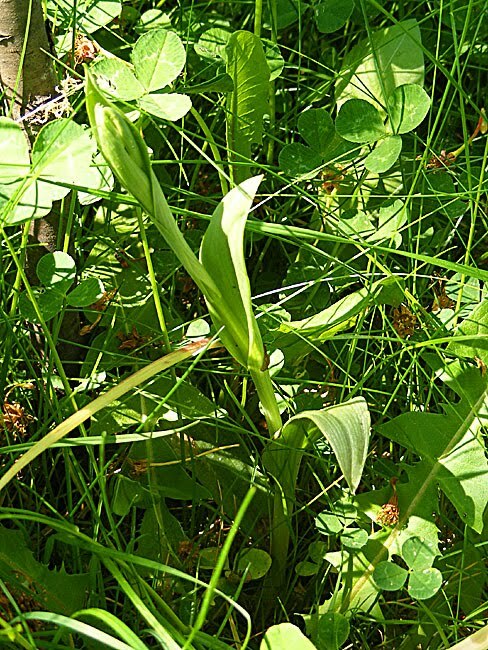 By mid-May it was clear that we had far more species of orchid in the orchard than I had expected from the rosettes of leaves that popped up in the autumn. Neither of the species I expected then have materialised, but what we have is just as good. A Bee Orchid with a well developed bud spike. 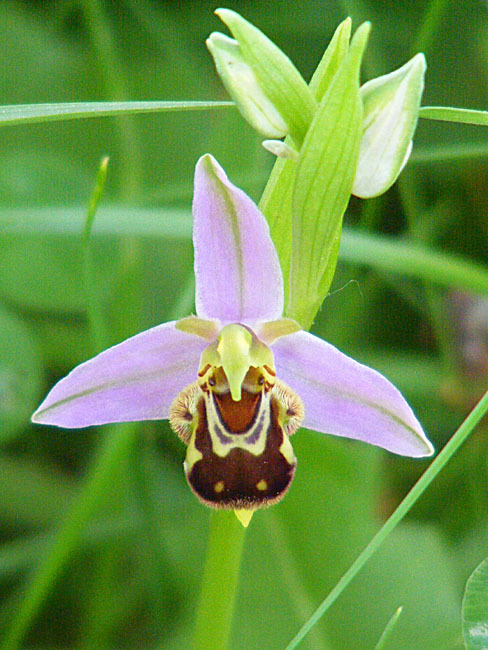 There is a substantial colony of Early Spider Orchids Ophrys sphegodes (Ophrys araignée), which were the first to flower, along with a single specimen of Lady Orchid Orchis purpurea (Orchis pourpre). Some weeks later, Bee Orchids Ophrys apifera (Ophrys abeille) started to flower in nearly as great a number. We had to transplant some orchids because they were in the way of the over-engineered grape vine trellis and at least one of these (which we had removed to the safety of our back garden) turned out also to be a Bee Orchid, which is now flowering quite happily. There was also a single tiny specimen of Greater Butterfly Orchid Plantathera chlorantha (Orchis verdâtre), which was just about to flower when it was hit by a late frost. 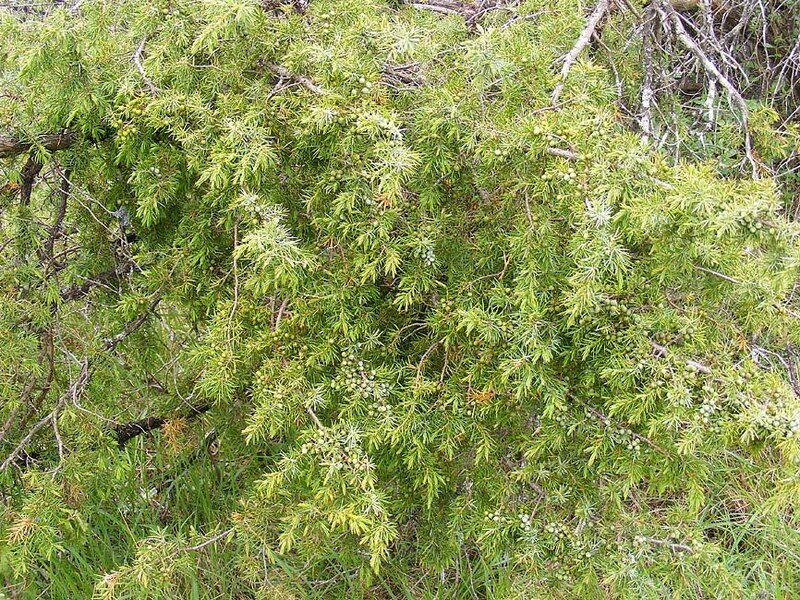 The flower buds turned brown, but the leaves are unaffected, so with luck it will return to flower next year. 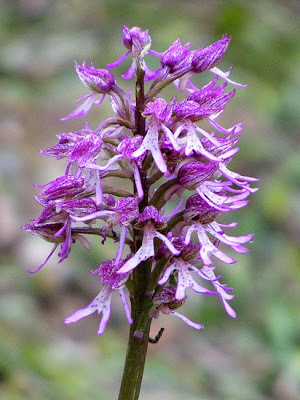 wild orchids in the Touraine, I think. It looks like we've got a Pyramidal Orchid Anacamptis pyramidalis (Orchis pyramidal) coming too, sending up two flower spikes full of close packed buds. Other rosettes are preparing to flower, so it's possible we may get even more species by the end of the summer. Of course, this all depends on the weather being nice - which at the moment it isn't. We even had to light the fire yesterday. Remember poor old Steve the Siberian Iris, who sadly did not make the transition between London and Preuilly? Well, strictly speaking, he was Son of Steve, having been divided from the parent plant sometime earlier. Steve Senior actually arrived slightly later, and is clearly loving it here. The photograph doesn't do him justice. He is actually a much deeper, richer purple, not this bright royal blue. 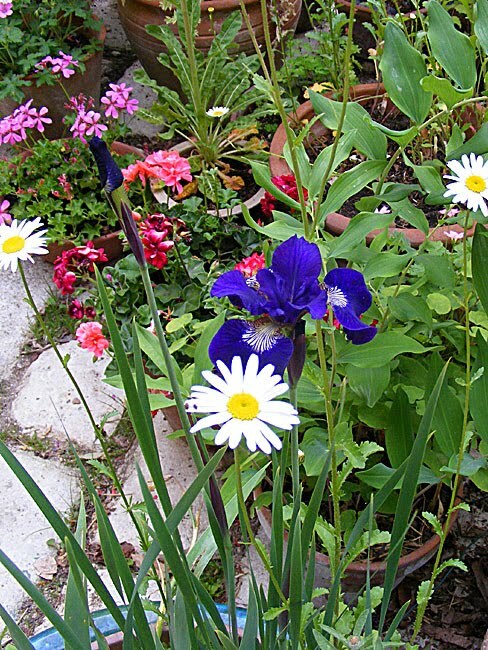 Since announcing Son of Steve's death, I have very kindly been given Siberian Iris divisions from the gardens of two friends, Jill and Nicole, so I am looking forward to seeing them flower too, and Steve will enjoy a bit of friendly rivalry I'm sure. 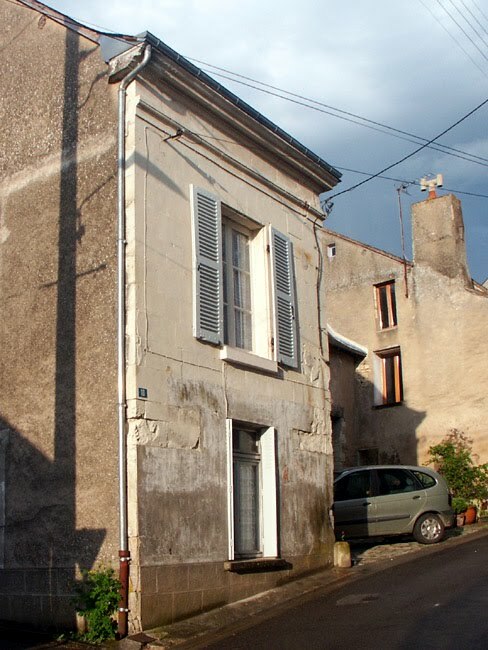 Today at 14hr30 French time it will be exactly four years since we first saw our house. We knew that the house was for us pretty quickly. We spent 20 minutes looking at the house and in the short walk back to the real estate office we had decided to get a survey done. Since then we have mainly been taking our time, which has meant that so far we haven't done anything we now regret. We may rue the lack of progress, but we have not had to undo anything. 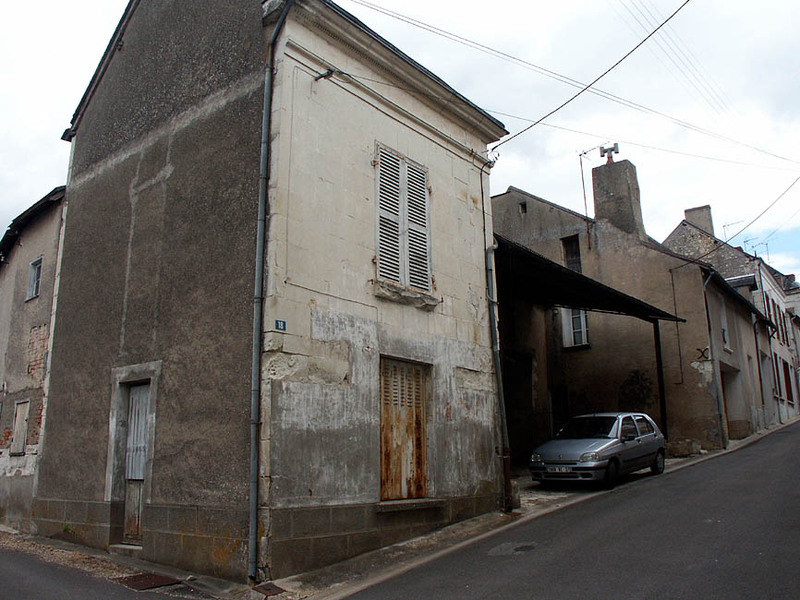 You can read more about our experience looking for a house here. You will be forgiven if you look at the above photo and think "hmmmm grey horse poo" - mainly because in days past horse poo would have been an ingredient. What you are looking at is a mix of chaux, sable et chanvre. We wrote a couple of weeks ago about replacing the bathroom window, and having to enlarge the hole it was going into because of a misunderstanding on my part about window sizes. 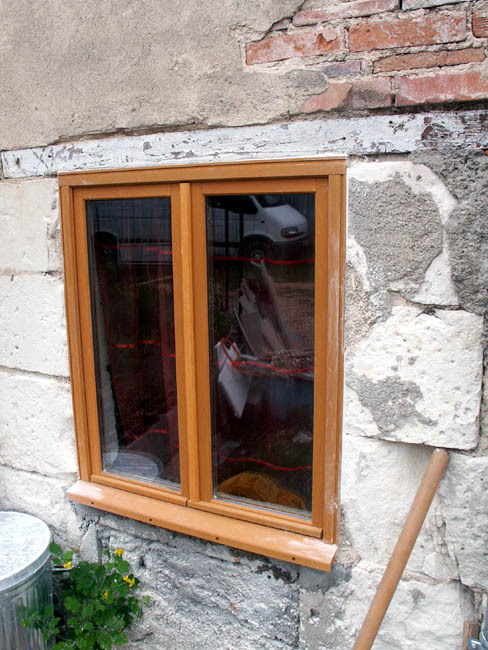 We managed to get the new window mounted in the hole the same day, but there were one or two holes in the stonework around the window where the tuffeau had broken. 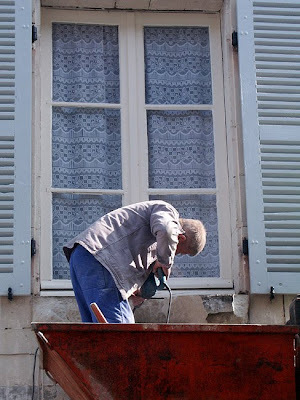 Yesterday Stephane decided we would fill the holes in the almost traditional manner, using chaux (hydrolized lime mortar). 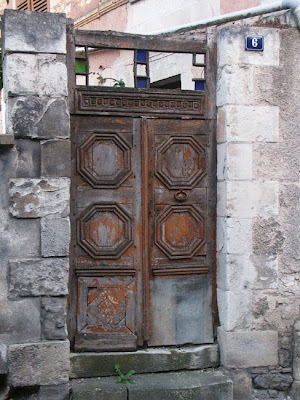 The break with tradition comes with the material used to provide insulation and reinforcing: traditionally this would have been a mixture of animal hair (goat or horse) and not to put too fine a point on it, poo. Usually horse poo, because horses have really inefficient digestive systems and the grass (or hay) gets processed without the fibres being broken down. Instead we used the modern and very trendy equivalent chanvre - hemp. The new window in place. Preuilly sur Claise has a long tradition of producing and processing hemp. 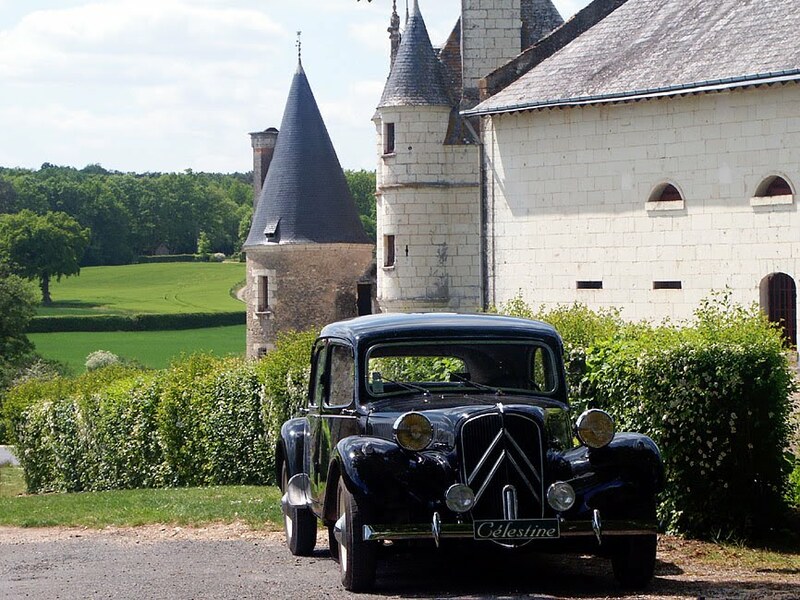 We have written before about the Moulin de Chanvre, which just outside the town. 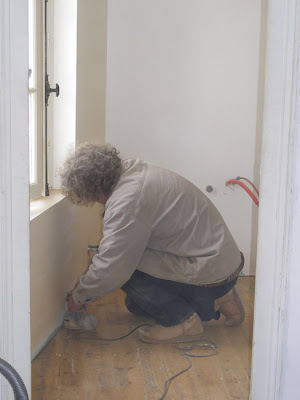 These days hemp is bought heavily compressed in large plastic bags, and is used on interior walls (and sometimes ouside walls) as an insulating material mixed with mortar. We are now starting to feel really integrated into certain aspects of the French system: yesterday we had to lodge our first personal tax returns. Susan had prepared our papers online, but we decided to get someone from the tax office to check them before we lodged them. This went really well (apart from me being told I must learn to speak French - where have I heard that before?) which meant that by lunchtime we were out of the tax office and looking for lunch. Luckily, our tax office is in Loches and as we had given ourselves a day off from building works we had time for a longer lunchtime than normal, in a town with plenty of choice of restaurants. 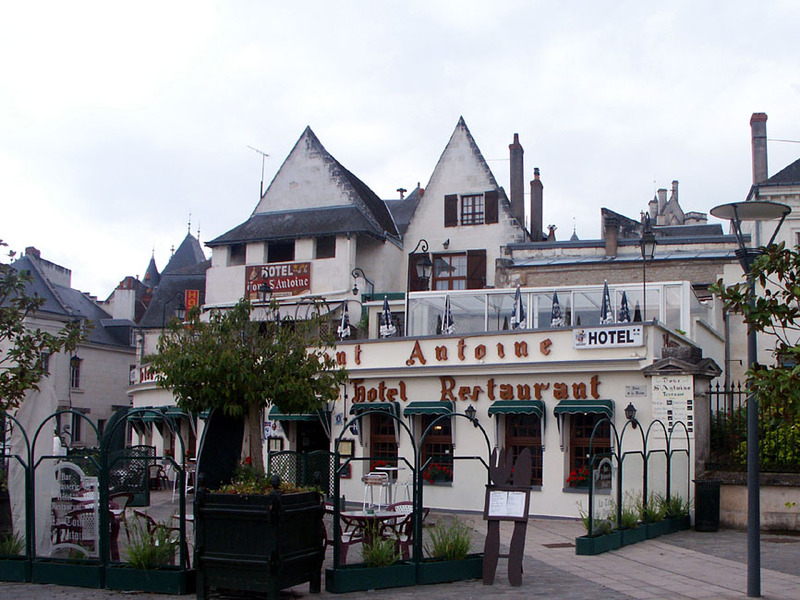 We decided to eat at the Hotel St. Antoine, a large - but it has to be said unprepossessing looking - establishment near the tourist office. 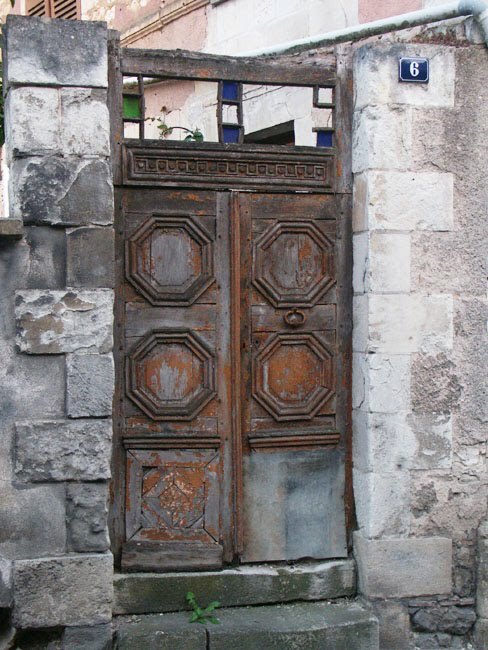 We have often looked at the place (it's hard to avoid) but not been tempted in. As we were treating lunch as a research project and the prices seemed extremely reasonable we decided to brave it. It is rather old fashioned in appearance and in style of service, but the meal was good and the waiters friendly and well trained. Susan's assiette of crudités to start was just what she wanted though, and my paté came with perfect toast. 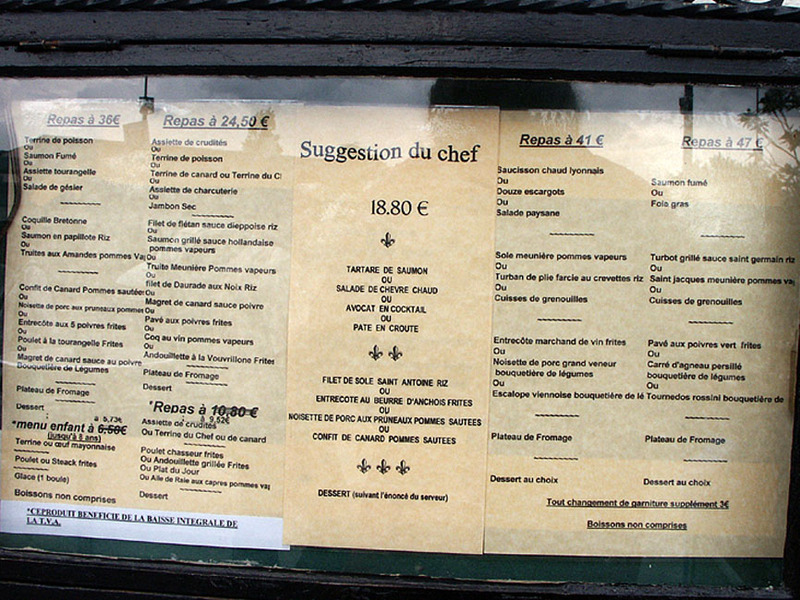 There was nothing at all wrong with the andouillete and chips, crême brulée or sorbets. The only disappointment was the plat du jour of noisette de porc, served with prunes and a potato and zucchini bake, which was very bland and uninteresting. It's unusual for a pork dish in the Touraine to be poor, so Susan was rather surprised to get something so unappetizing. €9.52 is not a bad price for three courses though! After lunch we dropped off some leaflets for the business at the tourist office and then went to meet Jean-Claude and Moha at Le Logis du Bief, a highly recommended chambres d'hôtes, to discuss mutual business opportunities. These two are clearly very switched on, very knowledgeable about the local area and offering an exceptional service in a lovely location. They said they get far more Australians than any other nationality staying with them, but hardly any Americans or French, which is curious. We got home about 4pm, and half an hour later there was a tropical downpour. It poured and the wind lashed the trees about. Our neighbour lost a nice apricot tree - the crown snapped right off. The street and driveway was a torrent of rushing water, but our new back door withstood the onslaught and we didn't get a flood inside like we would have with the old door. The bathroom window leaked a bit, as it always does when really serious weather comes up the valley from the west like that. 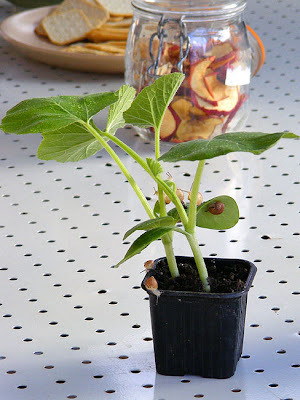 Hopefully this good rain and the warm weather will cause an explosion of growth in the vegetable garden. Up till now most things have just been sitting, waiting. ...and thanks to spending the day picking up 32 sheets of placoplâtre, 40 chevrons, 2 rolls of laine de verre, assorted rails, fourrures, montants and suspentes, several sorts of paint and a couple of storage crates from BricoDepôt, then offloading the same at home, we feel we can now demonstrate the meaning of this word with confidence. All this materiaux will be going into our new kitchen. Not me. Not even Susan. A certain French lady who lives in our garage had a sulk yesterday. I would hate you to think that meant she wouldn't start: quite the contrary. 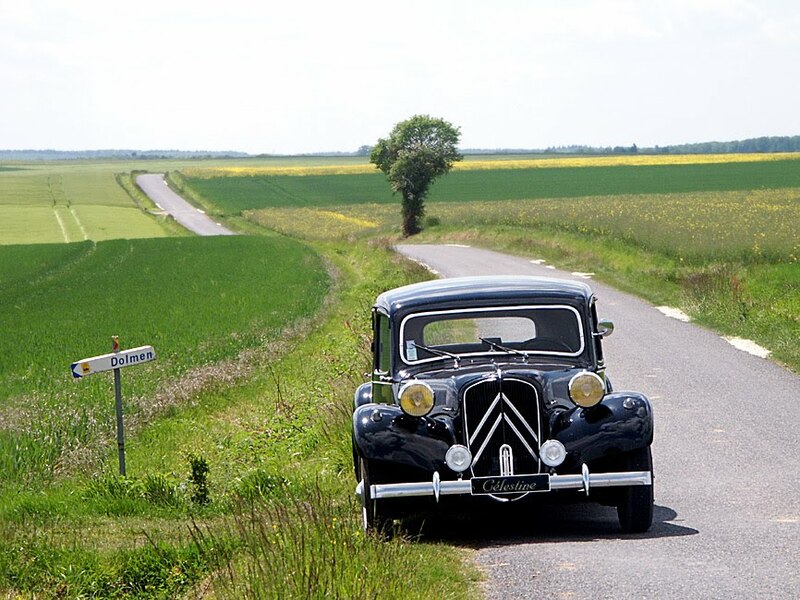 To start a Traction Avant you have to pull on the starter switch. This pulls on a wire that turns a shaft with a little cam on it that depresses at copper spring (which is attached to the car body) onto another lump of copper (which is attached to the battery), thus putting current to the starter motor. Our problem was that the copper spring wasn't disengaging from the copper lump, and the starter was continuing to turn once the engine had started. How the starter switch works. Normally, this would not be a serious problem: just turn off the ignition and the flow of electricity to the switch would stop. Unfortunately, with Traction Avants the ignition switch only controls power to the ignition (i.e the coil and thus the spark plugs). This is how you can flatten the battery if you forget to turn the ignition on - there is always power available to the ignition switch. The starter will crank and continue cranking until the battery goes flat, but without the ignition (in French "contact") turned on the engine will not start. All this meant that the starter was turning over and over - relentlessly - and I could not stop it. There was a moment of panic, because I didn't actually have any spanners with me in the garage at the time, so I had to leave Célestine grinding away while I ran into the house to get a spanner to disconnect the battery. This stopped the problem of the starter turning, but got us no closer to being mobile. After an age fruitlessly searching on the internet I decided the only option was to take the switch apart and have a look to see what was happening. 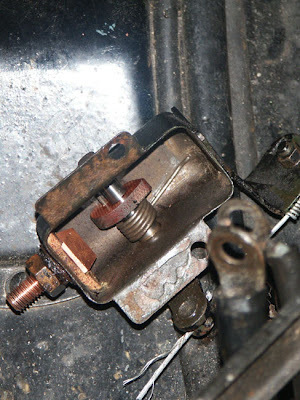 With my eyesight, in a dark garage, torch clench between my teeth and reading glasses on, I found a screwdriver, managed to wurgle it between the exhaust manifold and the carburettor and took the switch off. 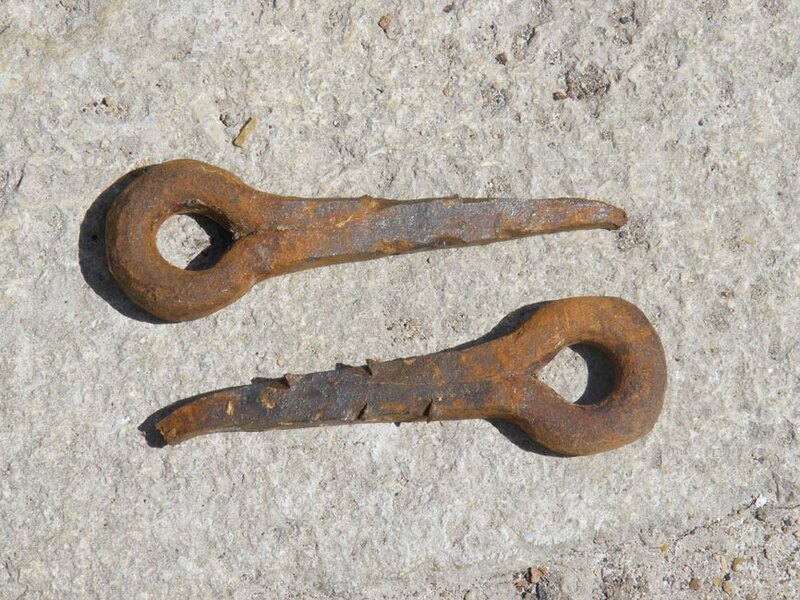 After some twiddling of bits I decided to pull on the spring a bit, and managed also to lower the copper lump a bit. I figured this would give me a bigger gap between the lump of copper and the spring, hopefully disengaging the starter. After more plumbing language I managed to get the switch screwed on again (not easy with fingers the size of Mike Tyson's fist). I then - very cautiously - re-attached the battery. The starter remained silent. Susan climbed into the car, and I tentatively pulled on the starter cable. The starter turned over. 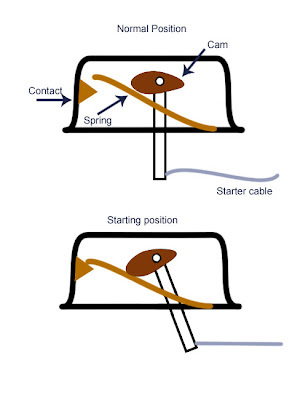 I released the starter cable - and the starter stopped. We then tried the same with the ignition on, she started first time and the starter didn't keep spinning. This is a result. I went for a drive to check that it was all going to continue to work, and so far so good. This is the first real fixing of stuff I have done on Célestine, and I am rather pleased with myself. I am so pleased she is a mechanical car, and if you look at things long enough you can work how it works. On a modern car it would have meant another trip to the garage to have a computer chip looked at. Pleased? You betcha. I just hope I don't have to repeat the process any time soon. Posing on a plantain flower. 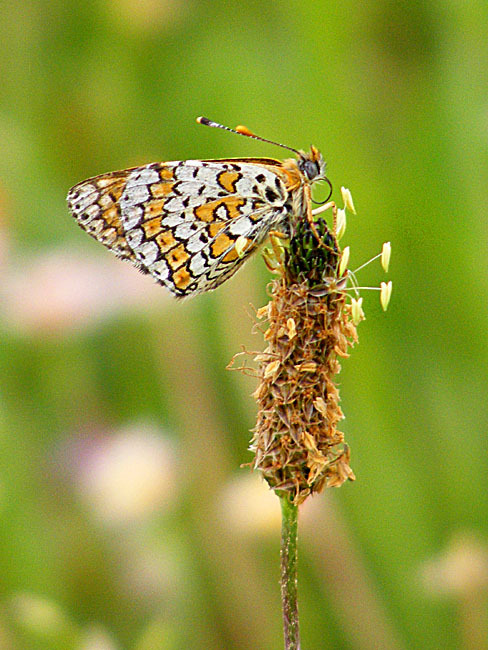 Our orchard is home to a good population of Glanville Fritillary butterflies Melitaea cinxia (la Mélitée du plantain in French). In April I had to be careful not to tread on the caterpillars as they munched their way through the Speedwell Veronica spp (our Glanville caterpillars seem to prefer the speedwell to the Plantain Plantago spp, although I have seen them on plantain as well). 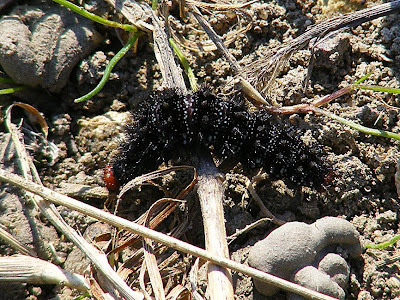 The distinctive caterpillar with its black body and red head. 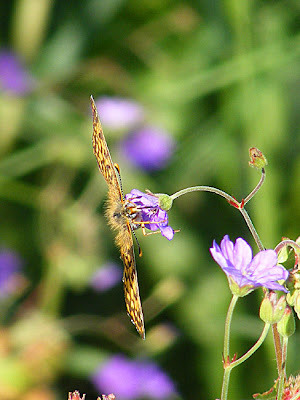 I particularly like this butterfly, not least because there is a nice story attached to its English name. 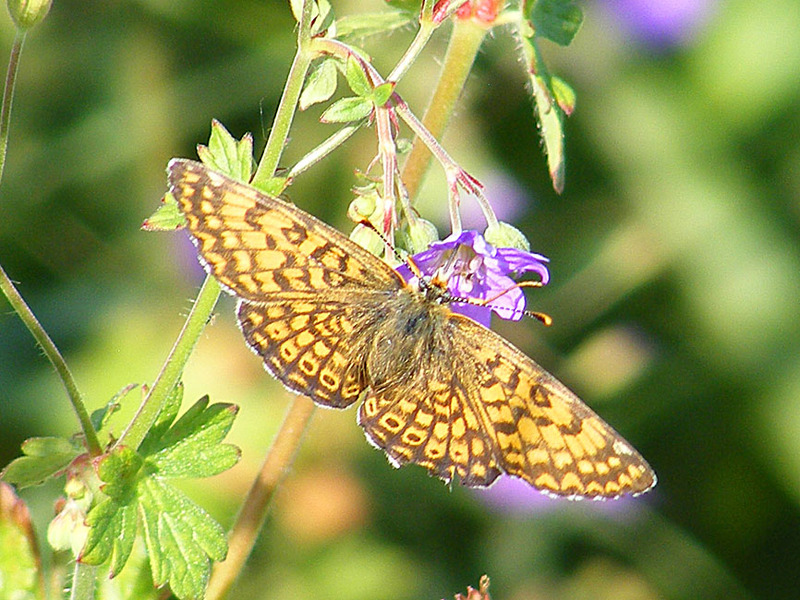 It is named after Lady Eleanor Glanville, a 17th century English aristocrat and one of the first people to seriously study butterflies. Parts of her natural history collection and correspondence still exist, kept in the Natural History Museum in London. 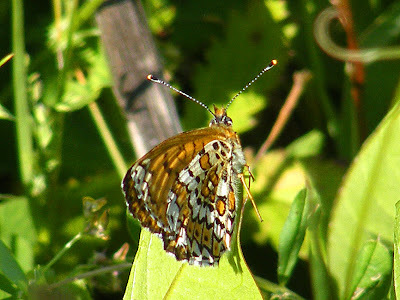 When she died, her son tried to overturn her will on the grounds that no sane person could be that interested in insects, and therefore her will, with which he was disappointed, was invalid. On cool days they will pose on flowers for a considerable time, but once the weather warms up they are amongst the most difficult creatures to photograph, flitting from flower to flower and zig-zagging across the top of the grass. Feeding on a wild Geranium spp (cranesbill). They are common in the Touraine, on the wing from April to September. The steps up from our entry hall to the graineterie are really old. Even if they didn't have interesting hardware attached, the rickettiness (is that a word?) would give it away. Yesterday we had a good long play with the steps, and in the process discovered quite a bit about them. 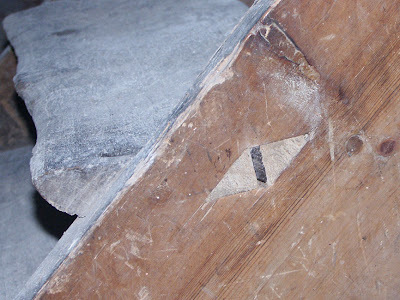 The joints where the steps are attached to the stringer are of a pattern I have never seen before - a lozenge shaped wedged mortice. 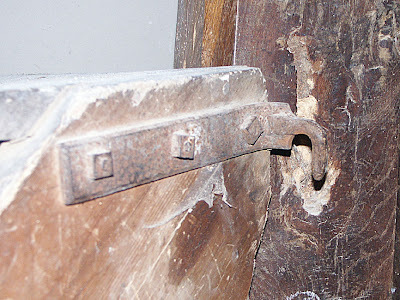 It is obvious that they steps were made by a real artist - I can't imagine that this sort of join is terribly easy. 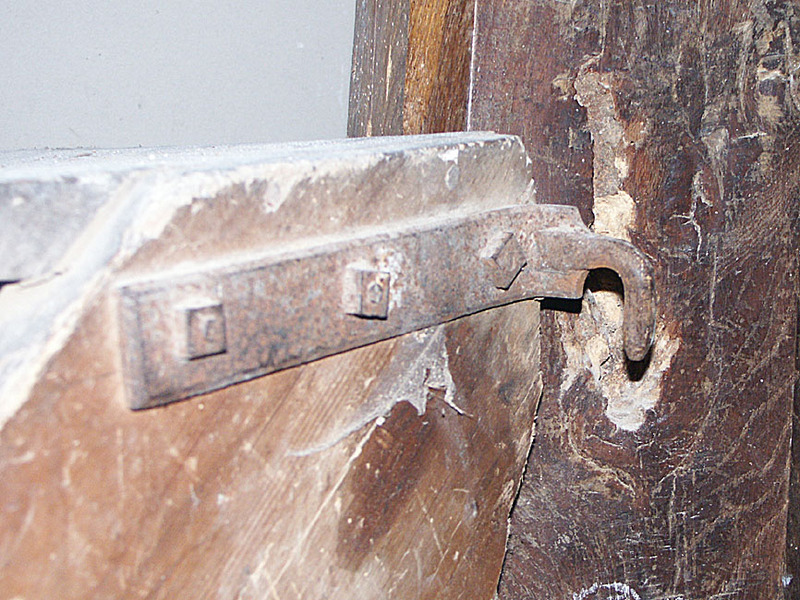 The ironwork is also interesting: the steps are made to be removed to allow access to the vide sanitaire, so the steps have a pair of hooks at the top that fit into a corresponding pair of rings fixed to the final floor joist of the graineterie. All the ironwork is artisan made - the rings and hooks are forge welded, probably by the same blacksmith that used to shoe the horses that were kept in the stables (now Célestine's garage). 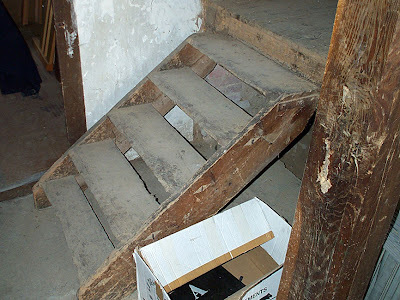 We really like the steps, for all their faults; yes, they are dangerously worn, and they are not terribly aesthetic but they have real character. We will eventually have new steps made, but we will find a place for the old steps to live out their remaining years without big blokes trampling up and down them. If you're on your way to this part France next week, you're in luck - the weather is expected to be really warm - highs in the high 20's (28° on Monday), lows around the 10°-12° mark. 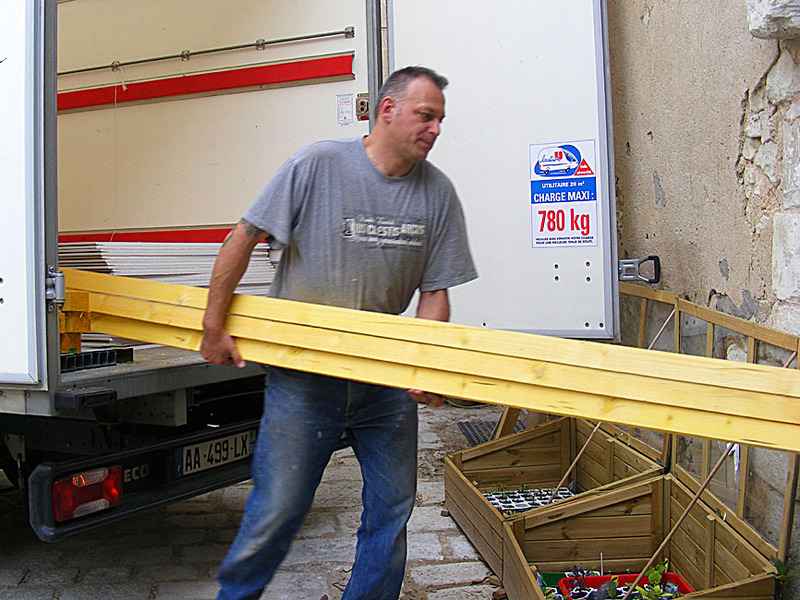 We suspect that winter is finally over, but we are keeping some wood in the house just in case. Chenonceau may be the most visited tourist attraction in France, and the carpark always packed, but it's popularity is well deserved. On a sunny day in May the gardens are lovely and the interior always magnificently presented. The back of the stableblock at Chenonceau. The French for stable is écurie. 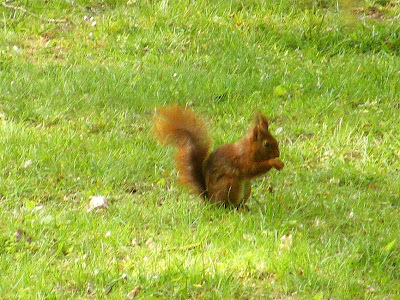 The grounds are home to a wide variety of wildlife. The French for squirrel is écureuil. Unfortunately, French people never have any idea whether I am talking about stables or squirrels (écureuil is notoriously difficult for the non-French to say). 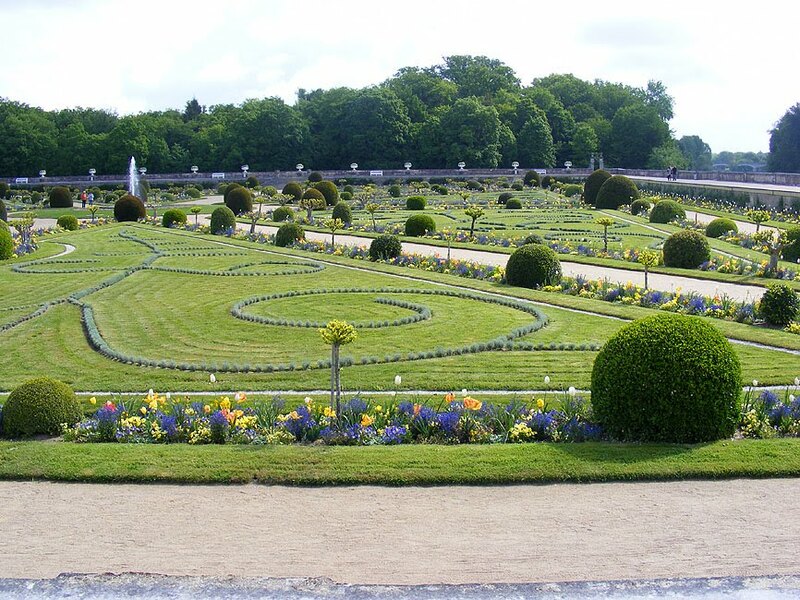 The formal gardens, in blue and yellow this spring and looking superb. 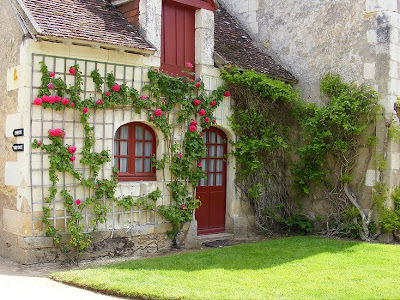 A rose growing on one of the farm cottages within the grounds. I think the rose might be the Bourbon Mme Isaac Perrière, one of my favourites. Unlike many of our other glimpses, this one is isn't hidden, you don't have to look down an alleyway, nor do you have to be looking at just the right angle before you see it. 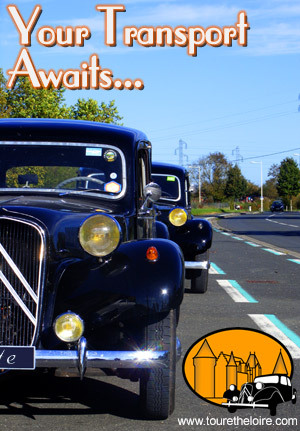 It is hidden in plain sight on the busiest road in town. I wonder how many people have noticed it? 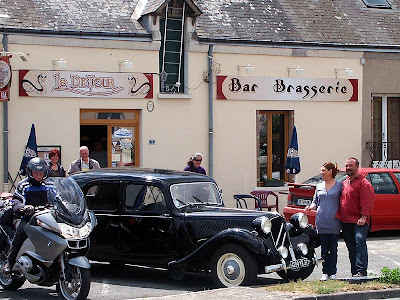 When we were out and about with Martine's friends on Monday we had lunch at le Detour in Civray-en-Touraine. 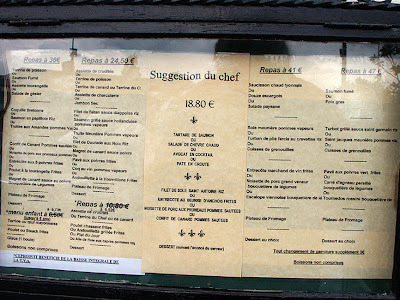 The restaurant is very conveniently situated for Chenonceau, where we had spent the morning, and Laurence and Philippe, the proprietors, are très sympa. For entrée 3 of us had the chèvre feuilleté. Simon opted to just have a large plate of choucroute, which he loves and he said was excellent. It certainly looked as good as choucroute is capable of, with several different meats attractively laid out around a pile of pickled cabbage (I'm afraid I can't like choucroute, especially in the quantities it seems to be served). Our Belgian clients were dubious about having choucroute outside of Alsace in France and so they happily settled on spinach lasagne. Below, from left to right: some unknown bloke on a motorbike, our clients Béatrice and Jean-Luc, Célestine, me, Laurence and Philippe in front of the restaurant. I think I made the best choice of all though. Daringly, I chose steak. 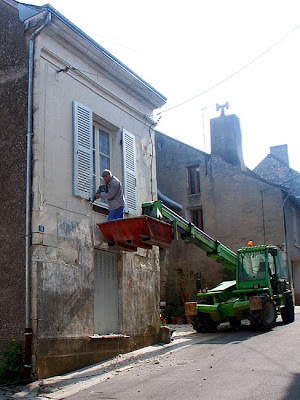 This is a risky thing to do in France. It often arrives at the table not quite quickly enough, having not been cooked with quite enough attention, and it is like chewing through carpet. It's often very tasty, but the effort required to eat it outweighs the flavour. Nothing like this is likely to happen to you at le Detour. Here, the entrecôte is perfect - tender, juicy, seared on the outside, like red jelly in the centre. Charmingly, Laurence says that it is because the beef she buys is so good, from a supplier she trusts, and she takes none of the credit. But I know that the best beef can be ruined on the hotplate if the chef doesn't know what they are doing. Laurence makes perfect chips too. For dessert there was a moelleux au chocolat, with crêmes anglaise and chantilly. It arrived suitably squishy in the middle with the proper very thin sugary crust. We all liked it a lot. 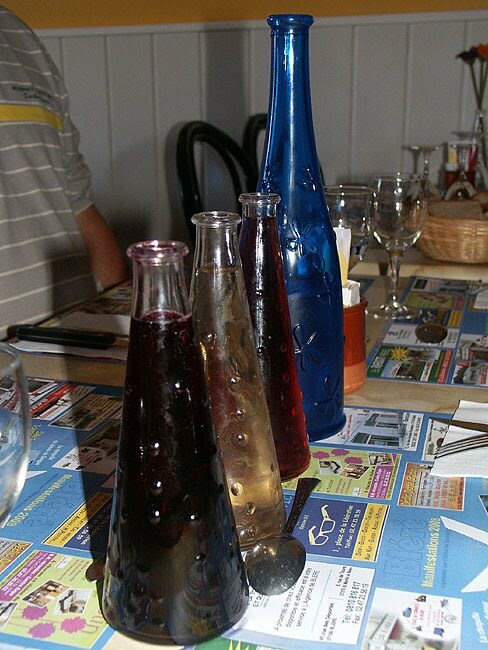 We paid €13.50 per meal for the food and €8 for three little pitchers of wine (one of each colour) from the grower up the road from them (Claude Aupetitgendre), all excellent. They are such nice people, everyone is made to feel at home and welcome. Laurence speaks excellent English too. Our friend Martine arranged for us to take some friends of hers out in Célestine for a treat, so here are some pictures of the day. Célestine waiting patiently at the end of the track leading to a prehistoric burial chamber near le Liège. 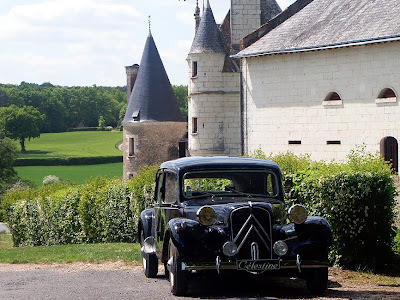 Célestine in front of the Château de Montpoupon. 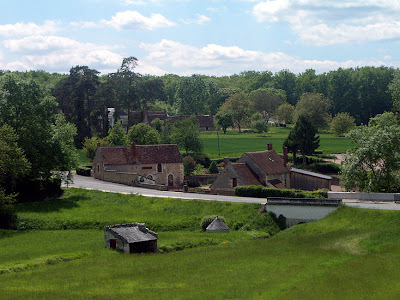 The view from the carpark at the Château de Montpoupon, looking out over the neighbouring auberge. I mentioned the other day that the bathroom floor isn't in as a good a condition as I expected. At some stage there has been a leak in the roof and the windows haven't been watertight. As a consequence, not only has the wood been water damaged, but it obviously became very appealing to wee beasties of the burrowing kind. After posting about this before we received lots of good advice, all of which we considered carefully. 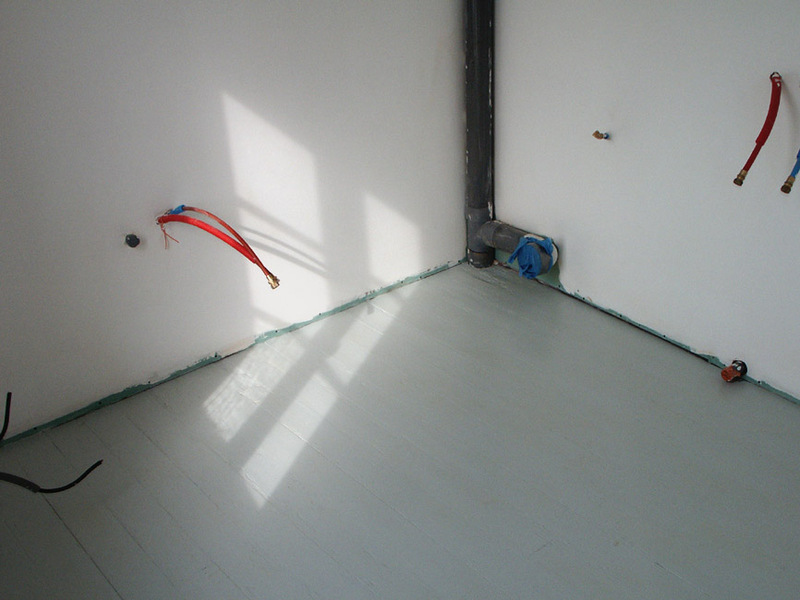 In the end, we decided to paint the floor with an exterior paint and then use an exterior varnish over the top. This gives us (we hope) a waterproof but interesting floor that shows its age without being too rickety looking. The one thing we really didn't want was a perfectly smooth and bland new looking floor. Susan applying the first coat of paint. After two coats of paint and one of varnish. By the time we have finished the floor will have had two coats of paint and three of a clear exterior varnish. The varnish has slightly yellowed the colour, but the floor feels smooth underfoot, with no danger of splinters. The masons have been gone for 3 weeks now, but we still have the dust to remember them by. While we are doing so much work on the house it hardly seems worthwhile trying to clean away any dust - you know you will just be making more dust tomorrow. 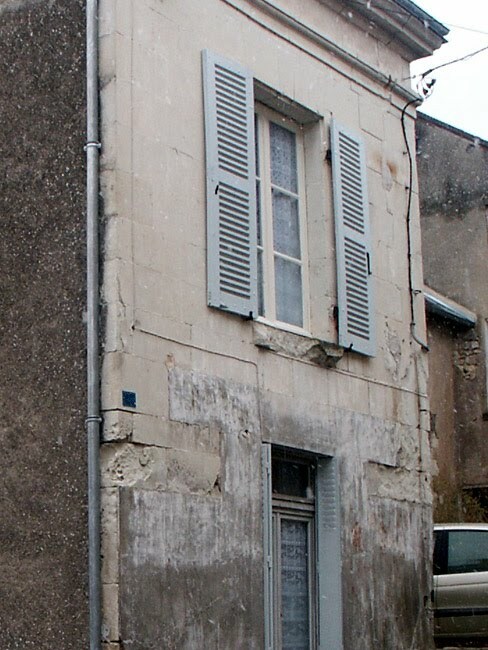 One of the little jobs we had done while the masons were here was replacing the window sill to our bedroom. When we bought the house the sill was cracked and unstable, so while M. Douady was here building the chimney we had him remove the loose piece. L'Eperon Barré de Murat ('the barricaded spur of Murat') lies just outside the village of Ferrière-Larçon, about 20 minutes drive from Preuilly. 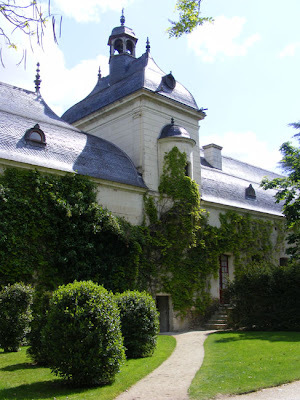 It's owned and managed by the Conservatoire du Patrimoine Naturel de la Région Centre, and yesterday I went on a walk there guided by Manuella Vérité, the Conservatoire's animateur for Indre-et-Loire, our département. 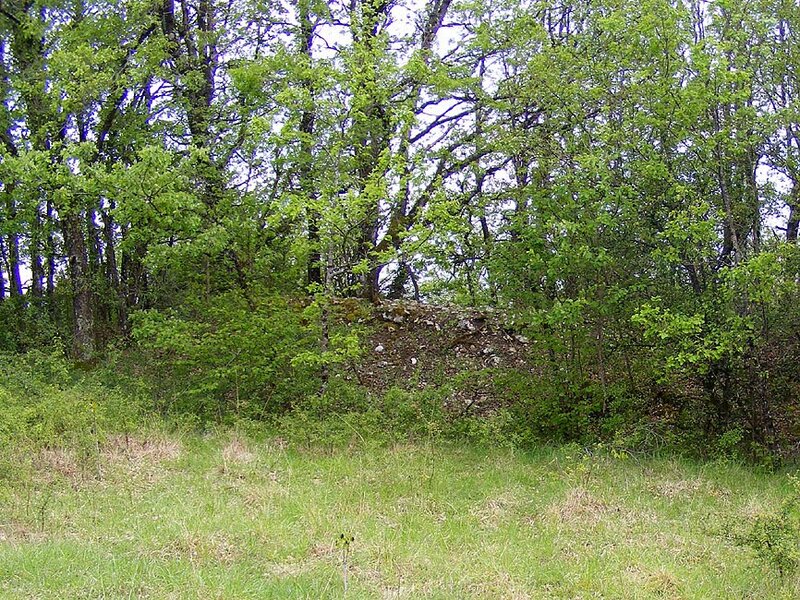 I was very keen to see this site, as it has the reputation of being the best orchid site in the département, and I was curious to see how it compared to my own favourite site, also on a ridge, on the outskirts of Boussay. I'd taken private clients there the day before and seen 7 species (later in the season it's possible to see 10 species here). Could the Eperon de Murat beat that? 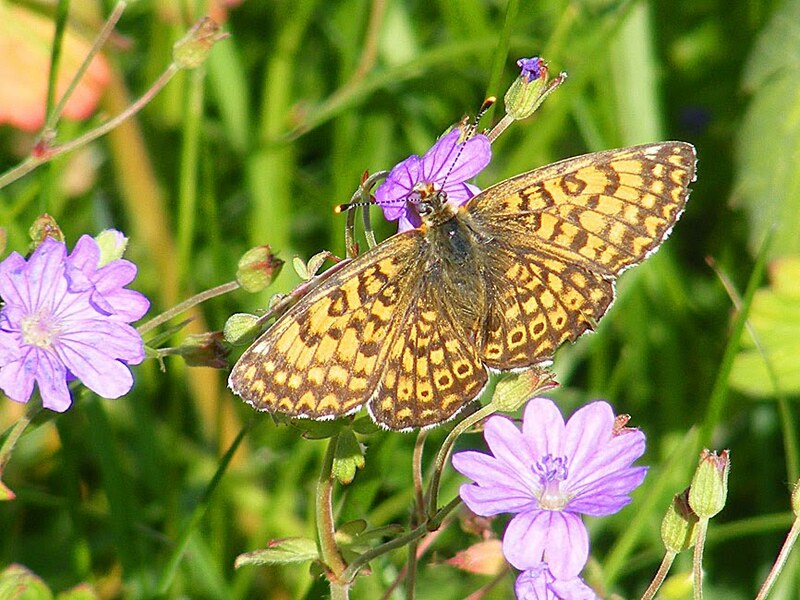 Well, yes it can – with 1 extra species and a clear example of a hybrid (and 14 species possible). 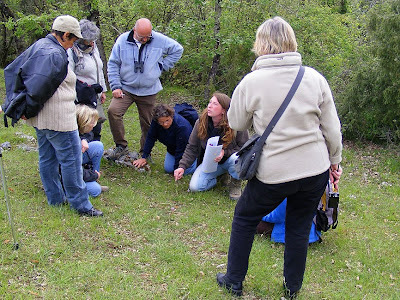 The group with Manuella pointing at an orchid. The Conservatoire manages the grassland by slashing part and having sheep graze the other part. 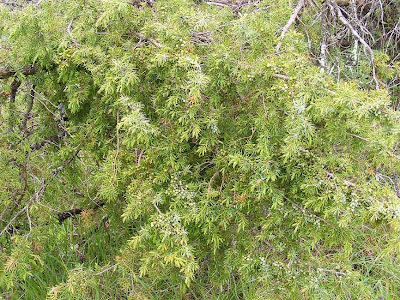 The slopes have many juniper bushes, a sure sign that sheep have grazed here for many years (the juniper flourishes because the sheep won't eat it) and are essential to maintain the stability of the ecosystem. The site is remarkable from a number of points of view. It's a plateau between the Brignon and the Larçon rivers, at the point where they join. The slopes face north and south. 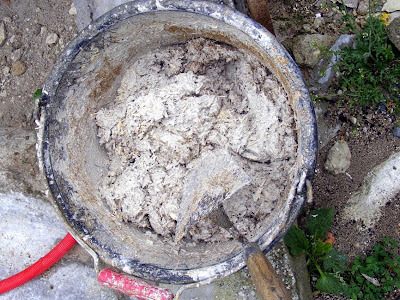 The tip is formed by yellow tuffeau (a grainy, sandy limestone with pellets of clay), separated by iron rich hard ground. The tuffeau has been quarried, and huge man-made caves now tunnel under the plateau. In Prehistoric times, the Eperon was ideal as a defensive camp, and two walls were built to close off the tip from north to south (hence it is barré). 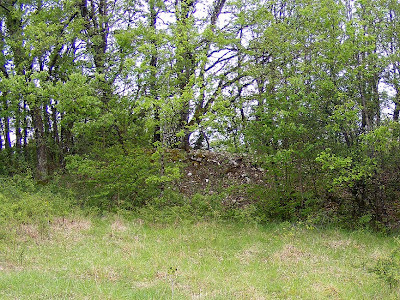 Part of the prehistoric wall. The soil is calcareous, shallow and poor, and the vegetation consists of species characteristic of pelouse calcicole, including juniper, chalk milkwort, and Fly Orchid. The soil is too poor for it to have been ploughed for growing cereals. 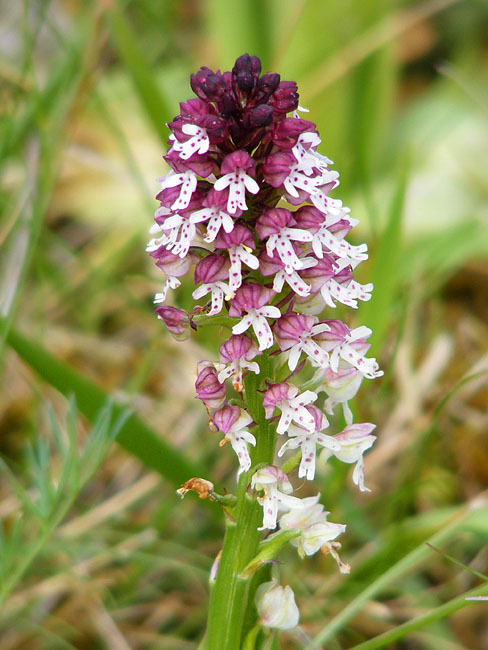 Burnt Orchid and Narrow-leaved Helleborine also thrive. Right in the middle of the plateau is an enormous and very old Woolly Oak. On our walk we saw Lady Orchid, Common Twayblade, Monkey Orchid, Fly Orchid, Greater Butterfly Orchid, Narrow-leaved Helleborine, Burnt Orchid, Early Spider Orchid, as well as a hybrid Monkey x Lady. The Fly Orchids are Manuella's favourite. She likened them to poupées gonflés (blow-up dolls), because they are pollinated by male bees, which fool themselves that the pheromone emitting flowers are female bees. A hybrid Monkey x Lady Orchid. I had hoped that we would be using the new bathroom by now, but it looks like it may be a week before that happens. This is because we have encountered one or two delays, the latest of which is the floor. By Tuesday Susan had finished painting the walls and ceiling, and we removed the sheets of cardboard we had put down to catch the drips. This gave us our first opportunity to check what the floor was made of - it just hadn't occurred to us before then. What we thought was chestnut with a thick layer of wax turns out to be pine, with a thick layer of wax over polyurethane. I experimented on the patch of floor that will be under the shower with various solvents as to the best way to clean the boards: vinegar, vinegar with cream of tartar (an idea taken from a page on the internet), white spirit, paint stripper, and paint stripper especially bought that is supposed to remove polyurethane. All of these products cleaned the floor, but didn't get us down to bare wood, leaving me with only one option - sanding. You can just about make out the bit I have done. 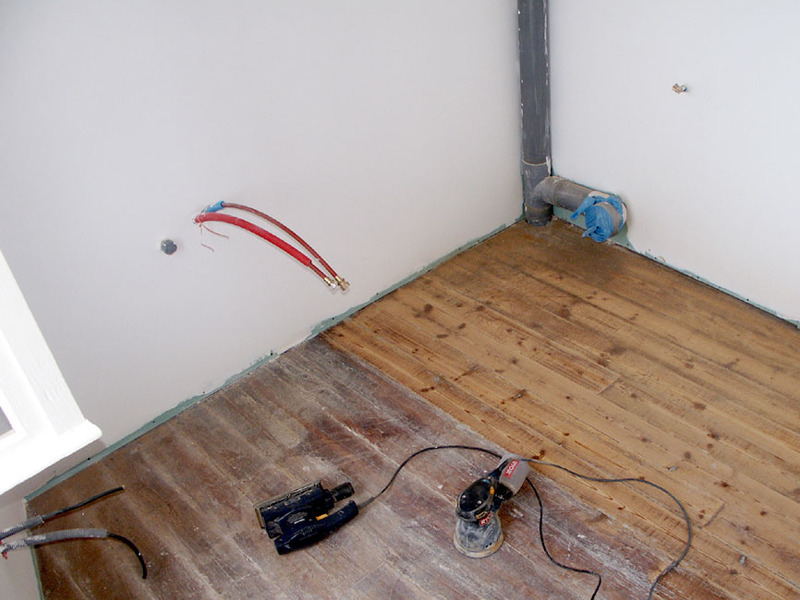 Because the room is so small - about 5 sq meters - we decided it wasn't worth hiring a floor sander, so I set to with a hand sander. It isn't fun, and it adds a whole new strata of dust to our collection. 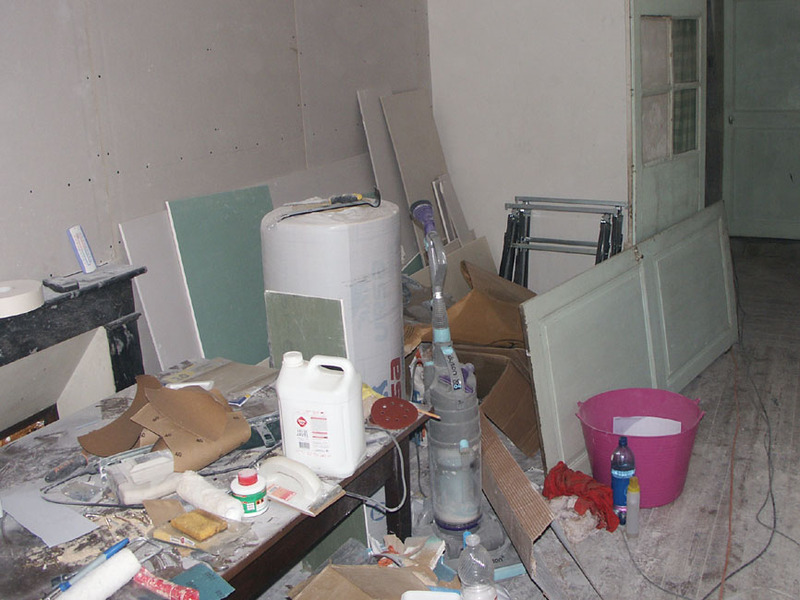 It also introduced a new problem to the mix: the floor has had worm at some stage in the distant past, and not only has the sanding made the holes more obvious, but it has also exposed a lot more of the damage. 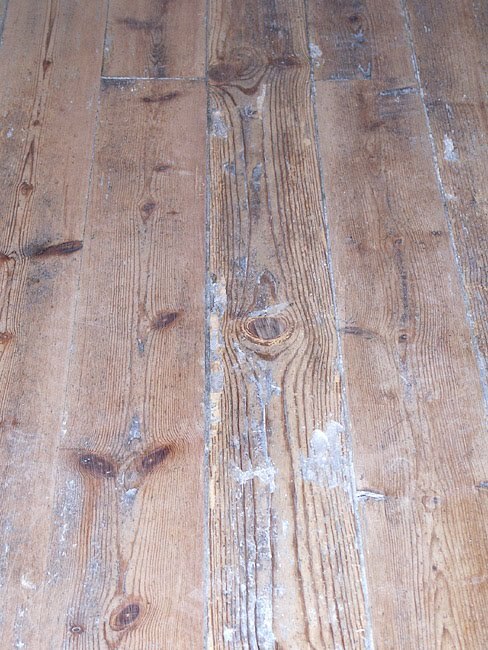 It has also revealed the fact that at some stage the floor has been sanded across the boards, leaving deep grooves. Our next problem, and one we hope to solve today, is how to treat the floor now. 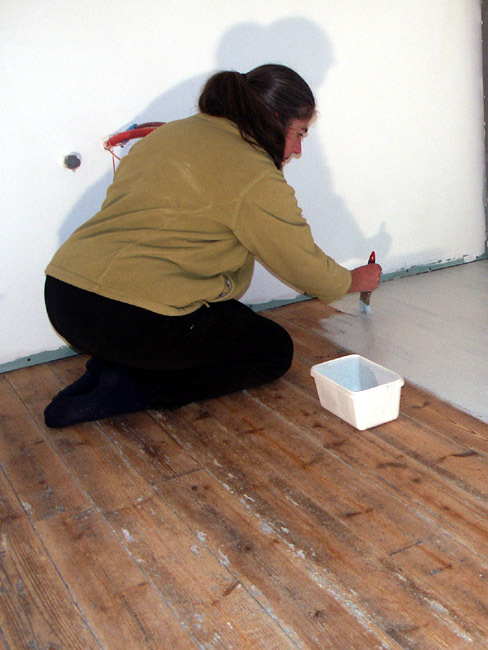 As I see it, we have four options: follow our original plan and treat the bare wood with an oleofuge/hydrofuge solution, varnish with a couple of thick coats of marine varnish, paint or stain the floor and then use marine varnish, or board the floor and lay either vinyl or tiles. Neither of us really like pine, but although we can't deny the boards have character at the moment we are tending towards the paint/varnish option. I figure (or hope) that we don't need to get too paranoid about it being a bathroom with a wooden floor as we are putting in a large shower cubicle and no bath, so we dont need to put down a completely waterproof floor. Bio in French is short for biologique, and is used in the same sense as 'organic' is used in English to describe a farming and food production philosophy which eschews the use of synthetic chemicals to control pests and diseases in agriculture, animal husbandry and artisanal foodstuffs. From left to right (and missing out some people whose names I don't know) there is Simon (camera), Guy (beard, at the back), Greg (pork pie hat), Aurélien (cap), Laurent (beard and topknot on the right). We were invited to attend a meeting and information session of organic farmers on Tuesday night. 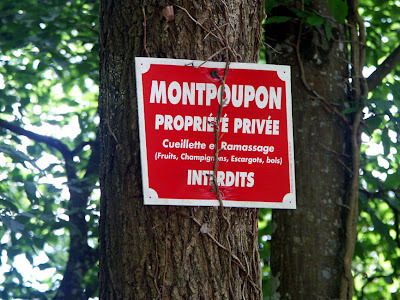 A group of them have set up AMAP Chèvrefeuille (Association Honeysuckle), to combine their marketing and sales. 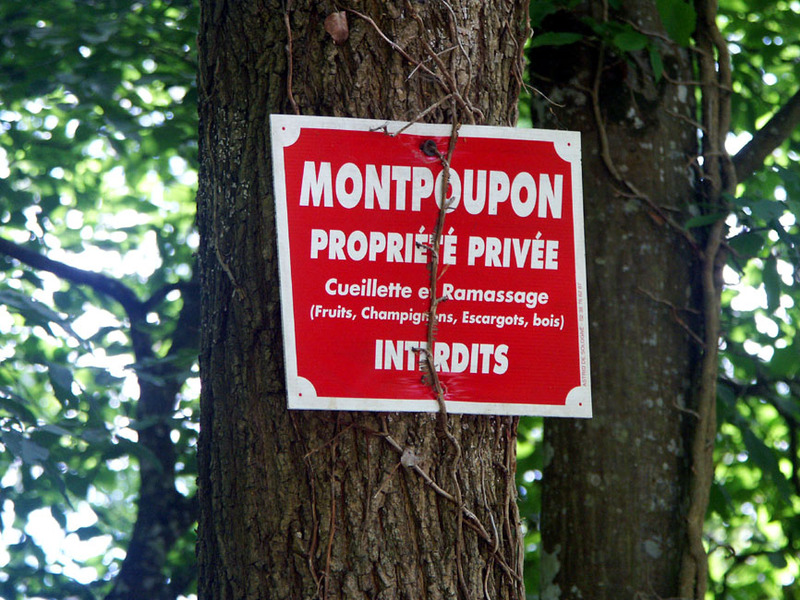 AMAP stands for 'association for the maintaining of traditional farming practices' or association pour le maintien d'une agriculture paysanne. 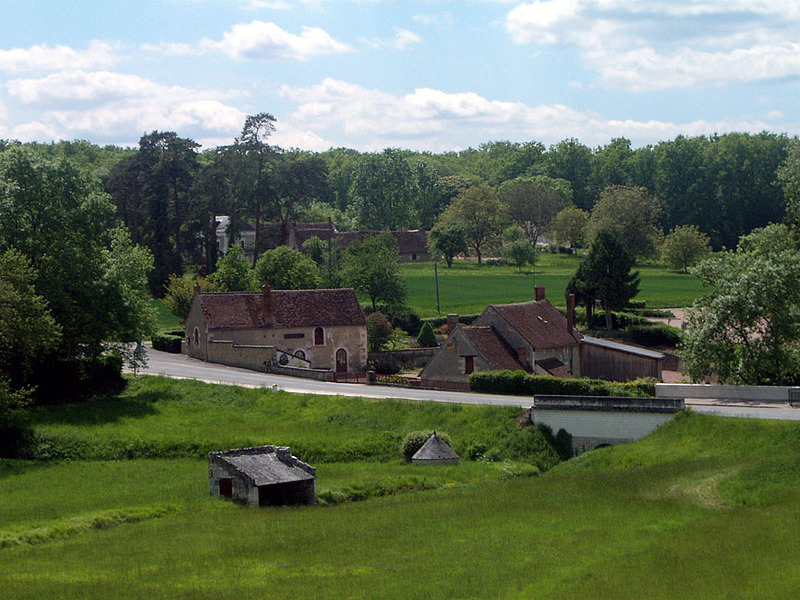 The meeting was held at Joe's farm, la Pouillère, between Preuilly and le Petit Pressigny. 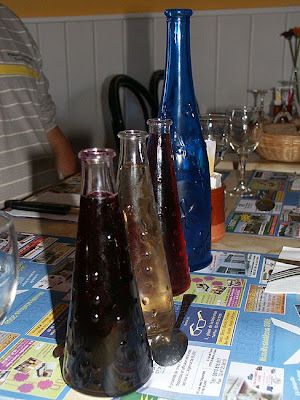 The weather was terrible, but we enjoyed apéros and the group discussed tactics. There was apple juice to drink and the nibbles were some fromage blanc with herbs to spread on crackers, dried apple rings and some saucisson with nuts made by a friend of Joe's over at Tournon St Martin. 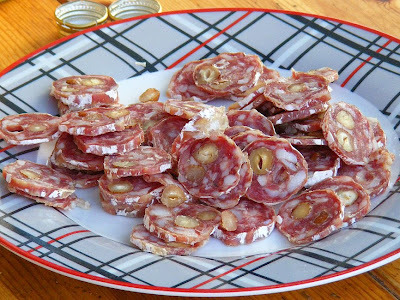 The saucisson was particularly good, made from an old breed of pig, half wild half domesticated, called Cul Noir (Black Bottom). They are slaughtered at 2 years. Saucisson made by Fred Gagnot at Tournon St Martin. Joe produces vegetables and goats' cheese. Last year he started a small scale box scheme, and this year says he hopes to produce 20 boxes of mixed vegetables a week from mid-June to the end of October. 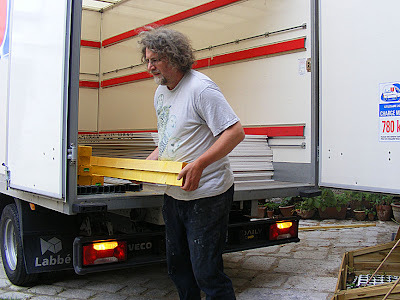 The boxes contain 5kg of vegetables (aubergine, topinambour, concombre/cucumber, melon, poivron/sweet peppers, etc) and cost 15€. Subscribers pick them up on Thursdays. Joe's goatshed was damaged in the tempête, losing its roof, but cheese production started two months ago. He had hoped to be producing the first vegetables by mid-May, but the cold weather has delayed everything, and now he is saying mid-June. 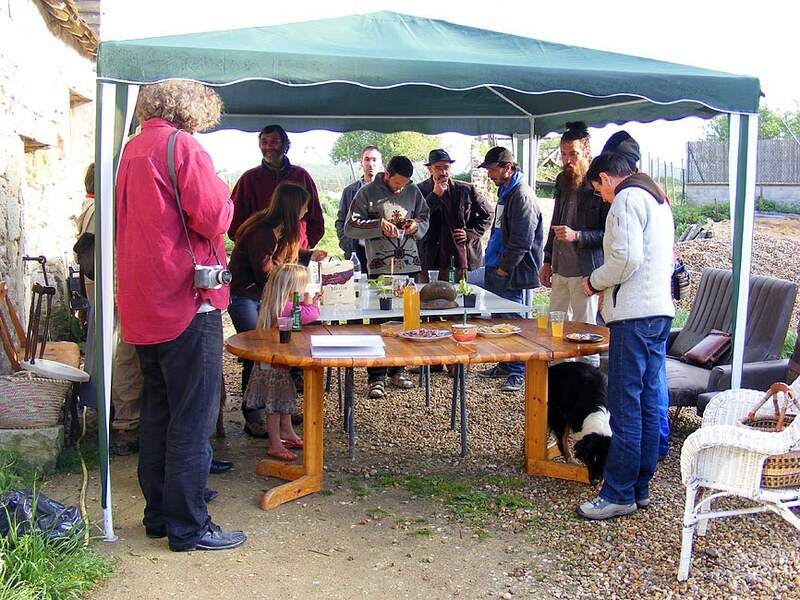 Baker Laurence is going to come to la Pouillère on Thursdays too, so you can buy bread and pizzas from 18.30 onwards. Beef and veal producer Aurélien is going to let everyone know when he has meat available. He raises grass fed Limousins. I learnt from him that the auburn colour of their coat is known as rousse, and that haylage is called enrubannage in French. His veal is slaughtered at 6 months and costs 14€/kg. The meat of the cows is 11.80€/kg. Both can only be bought in bulk, in 10kg lots. Joe is going to ask Angélique, who has a stall selling organic groceries at Preuilly and some other local markets, if she will come by once a month, to widen the range on offer. Greg brought some of his younger snails along. In the background some dried apple rings from the Durands. Also at the meeting was Greg, who has started France's first organic snail farm; Magali, a potter who is going to design and make some butter dishes for Joe; Laurent, a WWOOFer, who goes from AMAP to AMAP providing volunteer labour in return for accommodation and meals; and Guy and Mme Durand, with their apple juice.